Color image of a Lawrence Livermore National Laboratory exhibit at the 1984 National Computer Conference. 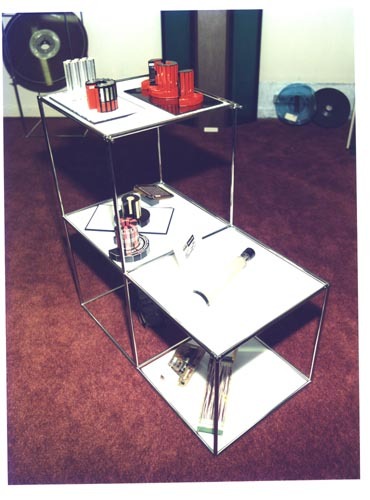 This is a stand alone display with four shelves. The left top one has three miniature Cray system mockups. The one beneath has two mockups with a core memory plane. THC right top shelf has a Williams tube. The bottom shelf has two system artifacts. on the rear wall are large disk platters.